According to Michael Pollan, the world is faced with two choices when it comes to food (stop the clip at 1:21). Option #1: Surrender to the Western diet and continue to eat junk food, processed food and fast food and wait for evolution to adapt us to it. Option #2: Change the way we’re eating! He sums up everything he’s learned about healthy eating in 7 words. What are they? Stop the clip at 1:21 and ask students to write down the 7 words and what they mean to them in their own words. Have students Think-Pair-Share with their shoulder neighbor and then share as a whole class. What similarities and differences did you see between your meanings and your neighbors? Is there one true interpretation? Explain. Discuss EAT FOODS and what that means: Eat REAL food from food groups & avoid the fake food. Real foods have no nutrition claims, no ingredient lists, little packaging and would be found in the outside perimeter of the grocery store. Ask students for examples. Discuss NOT TOO MUCH and what that means: Limit portions/servings; practice portion control and listen to your body. View the Ted Ed, How Does Your Body Know When it is Full? Discuss MOSTLY PLANTS and what that means: Eat food from plants that have been grown in the ground and are a part of the plant in some way. It would not come from an animal in any way nor would it come from a manufacturing plant/factory. Play 5 Second Rule game with MyPlate Plant sources. Eating meatless meals at least one night per week. Trying different plant based soups, sandwiches or salads.. Using less meat or poultry per person when preparing meals by building them up with whole grains, vegetables, beans, legumes and nuts. Have students look up the benefits of plant based diets both physically and financially and share the results. Results may include health benefits such as lower blood pressure, lower cholesterol, better blood sugar, weight loss and financial savings at the store due to the fact that most meats and meat products are more expensive to purchase than plant products. For Part I of this lesson, the focus is on beans and legumes. Ask students what the difference is between the two. This website does a really great job of explaining the difference between the two by making an analogy of a beans and legumes to peacocks and birds. 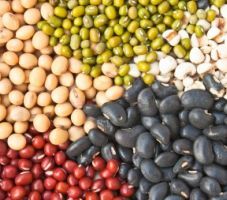 When looking at beans and legumes, it is important to know that there are a variety of ways to use beans and legumes from main dishes to sides and there are many forms available from dried to canned. Have students use resources to complete the “Bean & Legume” Chart. If you have a Food For Today Textbook, you can use the Chapter resources on beans and legumes to complete the chart. If you don’t, you can utilize the internet using the online Food For Today PPT Presentation on Legumes or this helpful website The Serious Eats Guide to Beans. Students will also practice calculating unit prices and cost per serving on problems involving canned and dried beans. Before heading to the lab, student will view an episode of Alton Brown titled “Cool Beans“, completing the guide sheet as they view. I have students prepare two different recipes. Options include a Vegetable & Bean Fried Rice which uses mostly plant based foods along with some eggs. The second recipe has students preparing “meatballs” and marinara, using garbanzo beans in place of red meat. These can be served as dippers, “meatball subs” or served over spaghetti. The third is a Southwestern Veggie Burger. And finally, a Mexican Rice option that uses black beans and is quick and easy. Image courtesy of sritangphoto at Free Digital Photos. I love this! Thank you so much for sharing your lesson(s)! !